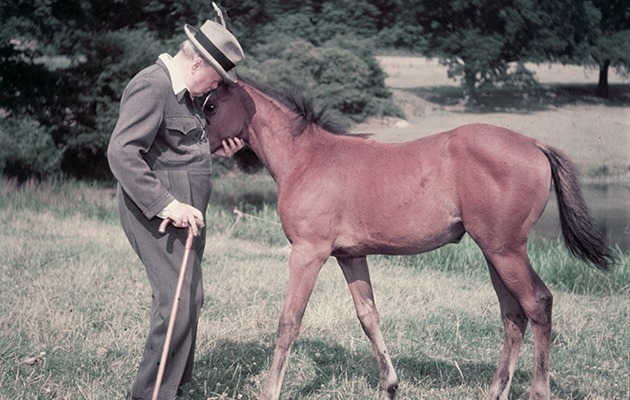 WSC with a thoroughbred colt, photographed for Life magazine, 1950s. Brough Scott, Churchill at the Gallop. Newbury, Berkshire: Racing Post Books, 2018, 230 pages, $34.95, Amazon $25.77, Kindle $9.99. This book is a delightful, educational and luxurious production for such a modest price. Printed on thick, coated paper with many illustrations, it weighs over two pounds. The only technical complaint is that, with lots of white space available, the type could be larger. It is actually pretty difficult to do, and that’s if the horse is standing still. Without taking your left hand off the reins, you have to raise your cavalry sword in your right hand across in front of you, and resheath it in the scabbard attached to the near side of the saddle. At 8.40 on a steamy hot morning in the Sudan on 2 September 1898, Winston Churchill did it at a gallop…. To keep his seat as he and his horse crashed into, down and through the seething, hacking throng in that dried river bed where the main body of the enemy were concealed, took riding skills and dexterity with a pistol almost off the scale. Take Scott’s analysis of young Winston’s letters to his mother to finance “the greatest of my pleasures” at Sandhurst. One letter “may have included the programme for [a race meeting]…but it did not start with saddle talk. It began with acute observations abut the Sino-Japanese war over Korea…. ‘I take the greatest interest in the fleets and armies,’ he wrote.” Even as a spindly Sandhurst cadet, his interests were global. The photos of WSC are mostly old chestnuts, but not all: there are charming post-World War II riding scenes with his daughter Mary. Scott’s “supporting” images include color prints of people and events, and the occasional surprise. (Did you ever see a carriage pulled by a team of zebras?) Scott chooses well. A photo of Hadendoa tribesmen, who fought for the Mahdi at Omdurman, dramatically conveys the valor that won Churchill’s respect in his book, The River War. Most of the sixteen chapters begin with arresting illustrations. A cartoon depicts the startled young Winston in Ireland on his donkey, confronting what he thought were Fenians. A chapter on Cuba begins with sketches of the Spanish column Churchill joined, which illustrated his despatches for The Daily Graphic. 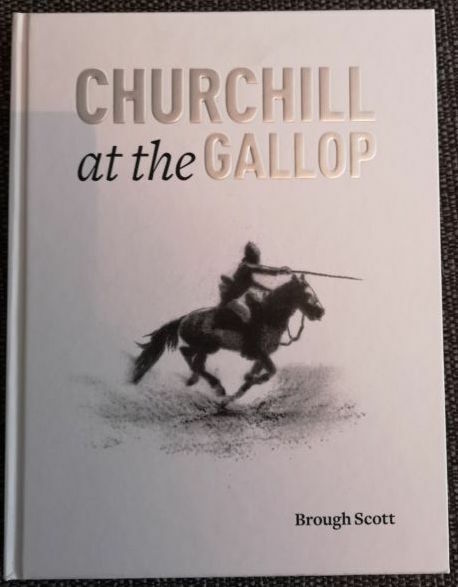 Thus we proceed through Churchill’s life, Scott drawing out horse references from his writings and those of specialist historians, like Hal Klepak on the Cuban adventure. Churchill’s campaigns in India, the Sudan and South Africa are beautifully laid out with contemporary photos, maps and plans. Before and after the Great War, his pursuit of polo is adequately documented. The emphasis is always equestrian, but these are as good accounts as you can read anywhere. Thus the book delivers much more than its cover promises. Winston’s parenting may have been unorthodox, not to say dysfunctional, by today’s standard, but there is no doubt that Jennie and Randolph left the deepest of impressions, and who is to say that he wasn’t reaching towards them in his diversions? He had long found precious solace in the painting at which his mother had so excelled, and now, in old age, he was about to re-register the chocolate-and-pink racing silks in which L’Abbesse De Jouarre [his father’s thoroughbred] had won the Oaks all those years ago. Dear Martin Gilbert warned us all never to say “perhaps.” He would always retort, “Perhaps not!” Scott avoids that, but puts his conjecture in a way Sir Martin might let pass. Who indeed is to say his thought doesn’t fit? It seems to fit very well.